Now that it is the wee hours of Monday morning, I am looking back at the activities of the weekend. 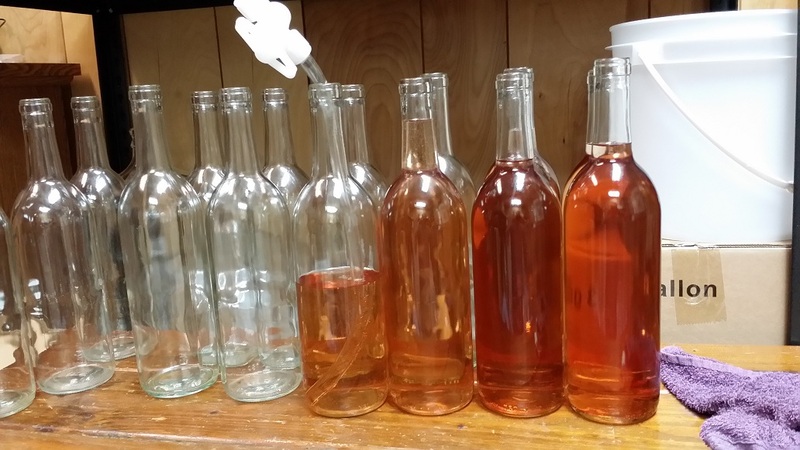 I finally got around to labeling the peach wine, the blueberry wine, the blueberry melomel, the fig wine and the raspberry cyser on Friday evening. Should have done it quite a bit ago, but just hadn’t. Finally! On Saturday, after guiltily having forgotten to make a friend ginger ale for almost a year, I decided to get things started. This time, I wanted a starter that I could keep going past a single batch of ginger ale, and as usual, I had a lot of options. 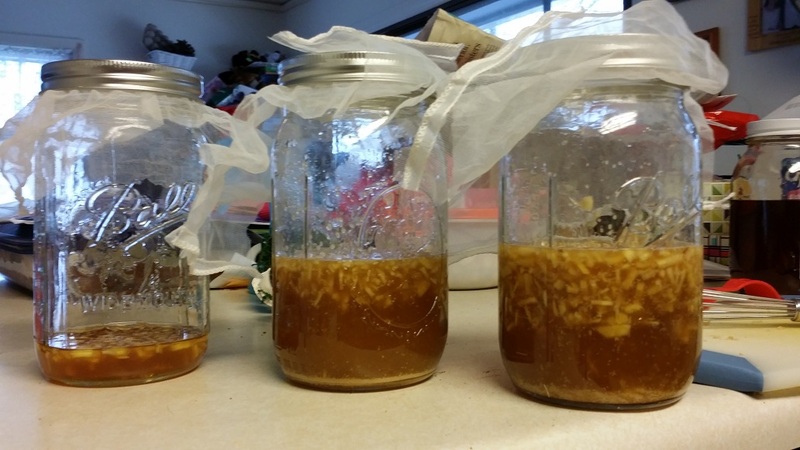 So I started three ginger bug trials (proportions based for the most part on this ginger bug recipe). What is the same amongst the trials is I am feeding the critters with local honey, and using distilled water. But the similarities end there. The second trial is based on bread yeast. I used 1 tsp. of bread yeast, with the container saying it is well out of date, but me guessing that there would be no issue in this setting (and I seem right so far). Since I don’t have to wait on the local flora to catch up, I decided to simply use the same quantities all at once. So that meant 12 tbsp. of chopped ginger, 12 tbsp. of the honey (3/4 cup) and 12 tbsp. (3/4 cup) of the water. That is bubbling nicely. I could probably use it now… but will give it some more time working on itself. The third and final trial is based on Pasteur Champagne wine yeast, and after a day and some, is the most pleasant smelling to me (not that the others smell bad!). As with the bread yeast trial, I started with all ingredients right at the start – and the ingredients are the same: 3/4 cup each honey and water plus 12 tbsp. of chopped ginger. I didn’t prepare the yeast per normal package directions… just added it to the mixture (that is, only 1 tsp. of the packet, about 2/3 of it). No ill effects, as far as I can see. Bubble aggressiveness is about the same as for the bread yeast. So with that continuing on its own, I got back to bottling this evening. Couple hours later I had another 45 bottles filled. The first fifteen bottles were blackberry wine, the next 15 Mars grape wine and the last 15 Saturn grape wine. Actually, the last Mars grape had to be topped up with just a bit of blackberry and some Saturn grape wine to fill the bottle. This entry was posted in Fermentation Log, Non-Fermented Beverages and tagged blackberry, blueberry, Country Wine, cyser, fig, ginger, ginger bug, Mead, melomel, peaches, raspberry, Wine. Bookmark the permalink. 2 Responses to Where Am I Going To Age Them? !